Just pulled this one out of the large tank & am curious as to what kind it is. Also, what would cause 2 snails to "go at it" with each other? 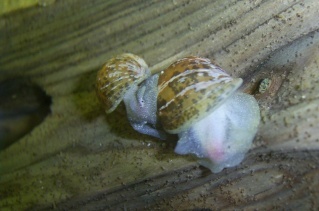 As in one was moving back & forth pretty fast like for a snail while attached to the other. Also found one snail that was all white except for a single black spot on the top of it's shell. Re: What kind of snail is this? Yes looks like basic pond snail that were having happy moments. does it have triangular "cat ear"-like antennae? What kind of snails are normally hitch hiking on plants from stores like Big Al's ? As for antennae, never saw any. Agreed on the pond snail. I've only had ramshorns introduced to my tank via plants, but I'm sure a good variety could come in such ways. @Sandman1969 wrote: What kind of snails are normally hitch hiking on plants from stores like Big Al's ? The most common snails to come in on plants for us are ramshorns and ponds. I'm still guessing those are ponds you have there, based on the pic, the shape/design of the shell looks like a pond snail. They move faster than a ramshorn (i.e. ramshorns are very slow - you can watch a pond move along quite easily), and, as mentioned above, their antennas are more "cat ear" like, or stubby, not long and thin like a ramshorn. So if they are pond snails, what kind of impact do they pose on the tank? I had a full water test done yesterday on it & ph, for this city's tap water, was good. Ammonia was .05. Rest were fine. I am in the middle of a water change now and will also be cleaning out the 10 gallon tub filter and replacing it's floss. Will also be adding more of those pot scrubbers to it. Yeah I'm guessing pond snails too. They look like the right shell shape. @Shell - good observation that they are faster than ramshorns! I have found that the pond snails are way better at evading assassins than the ramshorns, which are like sitting targets! 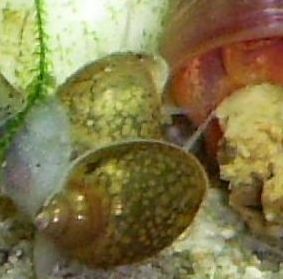 Sandman - The pond snails won't pose any more impact to the tank than ramshorns or other "nuisance" snails. They don't eat plants and make a good addition to your cleanup crew. If you dislike the aesthetic of having snails proliferate in your tank then you may have a problem. Mine don't bother me so I leave them be. I'm definitely no snail expert but I tend to agree with everyone that it looks like a pond snail. No issues with these other than a potential overpopulation if you overfeed. As for eggs, I'm guessing that like most snails any eggs laid by your fish are potential food. it's either a physa or pond snail, but I can't see the antenae. Pond snailsare known for stacking. They all seem to hate having another snail on their shell, but they all do it. This is another snail found in the same tank. It's different than the previous one. It does have antennae as when I put it back in the tank, it stretched out & had rather long ones. Ok since snails are not really bad for my tank, would it be safe to add a few of them to my 30 gallon tank? It's not heated as it has the fan tailed goldfish & a koi. No live plants but they are fed a 45% protein diet. sure, shouldn't be a problem at all! unless you really like snails I would think twice about introducing either of these to your tanks. Once in, always in! Neither of these are plant eaters (with some exceptions - I feed my pond snails salvinia and that oversize duckweed-look alike plant) but both (especially pond snails) will add heavily to bioload and eat fish eggs. This is a personal judgement call. The only pest snails I purposely introduce into my tanks are trumpet snails (to aid with aeration) and leopard ramshorns (just because I think they are neat looking!). All of the others go into our 'pest tank'. I do think that pond snails are cute, I just found it difficult to control their population in the guppy tank with only three fish. So, they were rehoused in the pest tank. For some reason, the trumpets in there don't seem to get out of control in the same way the ponds did. Well, I used to have 4 Oto cats in that tank, til I found one hanging out of the koi's mouth. He bit the head off one. I then pulled the remaining 3 & put them into the large tank where they are happy.